Can an agriculture revolution fight climate change? A Future Tense event. Future Tense Event: Can an Agricultural Revolution Fight Climate Change? Cars and coal may get most of the attention, but one of the biggest contributors to climate change is the food industry. Globally, agriculture accounts for at least 25 percent of humanity’s annual greenhouse gas emissions, according to the U.N. Food and Agriculture Organization. But some think that this situation could be radically changed—instead of just cutting agriculture’s carbon footprint, maybe we can use agriculture to reverse climate change. By harnessing photosynthesis’ power, experts think we can turn a major part of the problem into a solution. But can we take this new way of thinking out of the lab and into the policy realm? 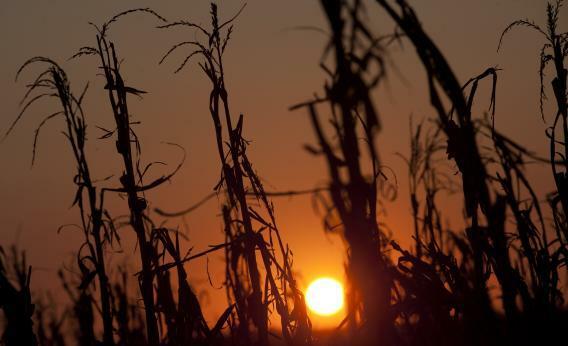 Will American farmers, many of whom deny climate change is man-made, get onboard? Will Big Agriculture join in—or is it too focused on today’s profits to worry about tomorrow’s climate? Join Future Tense on Thursday, July 25, at the New America Foundation in Washington, D.C., at 12:15 p.m. for a lunchtime conversation about how the food industry can help combat climate change. For more, read Slate’s special issue on climate change and agriculture. “Sun Food vs. Oil Food: Michael Pollan on how changing agriculture could reverse climate change,” by Mark Hertsgaard. July 2, 2013. “Why Don’t Farmers Believe in Climate Change? And does it really matter whether they do?” by David Biello. July 16, 2013.